This past week two interpreters made big news headlines, neither one of them was certified, but the reactions to them has been very different. 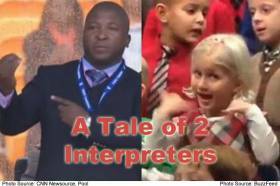 The first interpreter (Thamsanqa Jantjie) has been decried internationally by Deaf individuals whose reactions have ranged from confused to offended regarding his “interpreting performance” at Nelson Mandela’s memorial. The second interpreter was a little 5-year-old girl (Claire Koch) who has been called a hero for signing the holiday songs her kindergarten class performed for her Deaf parents. Each highlights the importance of audience consideration and interpreter quality—not to mention qualifications—and both can teach us important lessons about how to select qualified interpreters. During Nelson Mandela’s memorial service, which was televised internationally and involved eulogies and condolences from some of the world’s top chiefs of state, Thamsanqa Jantjie waved his hands around erratically in the guise of interpreting the program into sign language. Soon after he began interpreting, Deaf from around South Africa and beyond began buzzing on social media and calling in to complain about the fact that Jantjie was—at best—signing nonsense. Even those not fluent in South African Sign Language (SASL) could immediately tell that Jantjie was not using any sign language due to the lack of facial expressions and structure to his signing. However, Jantjie remained on stage throughout the memorial service. Since then, it has been confirmed Jantjie was not signing any known sign language, and indeed he did not even know the name sign for Nelson Mandela nor did he even attempt to spell the name. According to BuzzFeed, 5-year-old Claire Koch wanted her Deaf parents to also be part of and enjoy her kindergarten’s holiday program, so she surprised them by signing throughout her performance so that they could understand what was going on. Her parents were delighted with Claire’s performance and her mother even called her a hero. Since then Claire has become an online sensation and many have praised her sign skills and youthful enthusiasm. Beyond Thamsanqa Jantjie’s “performance” offending his audience and Claire’s performance being celebrated, each begs some serious questions and can teach us a lot about how to and not to hire and “do” interpreting. When I saw Jantjie throughout the Mandela memorial program, the first question that came to my mind was why wasn’t there more than one interpreter? Had there been at least a second interpreter, he or she could have stepped in when Jantjie was in distress, rather than have him continue throughout the program, only increasing the confusion and insult among the Deaf audience. Simultaneous interpreting (interpreting performed live and in real time with no delays) is mentally taxing. The standard for simultaneous interpreting is to require at least two qualified interpreters who each take turns interpreting in 20-30 minute increments. Studies show that even the best interpreters start to slip and miss information after more than 30 minutes of simultaneous interpreting. If there is a large Deaf audience, there may also be two interpreters used at once (one on each side of the stage) with backup interpreters relieving them. The interpreters who are on break or resting may opt to feed the active interpreter signs if the active interpreter(s) appear to be struggling with understanding the speaker(s). Having more than one interpreter increases the quality of interpreting by giving interpreters rest periods so that the interpreter’s mind remains fresh. Having multiple interpreters also allows them to assist or feed each other signs if relevant or necessary. Before you hire an interpreter or language service provider, be sure to complete a thorough background check and screening. A simple background check on Thamsanqa Jantjie would have revealed that he had already done this same stunt at an African National Congress where Deaf people had previously complained about his lack of sign skills. Since the Mandela memorial, Jantjie’s hiring company has completely disappeared and it has been found that two of the schools he referenced for his training experience do not exist. A professional language service provider should be able to show you their vetting process to guarantee that your interpreter(s) will abide by the code of ethics, confidentiality agreements, and most importantly will be qualified for the job. Ask your language service provider for sample resumes of the interpreters that will be interpreting for you. You may also ask for and check references for interpreters. For large conferences with multiple languages, you may even request that a project manager come along from the language service provider to ensure that no problems occur that will disrupt the meeting for the different language groups. Some have overlooked the fact that Jantjie flubbed the interpreting during the Nelson Mandela memorial and are more concerned with the safety and security aspect. Indeed, Jantjie himself has said that he suffers from violent schizophrenia and was having an episode. How was it that he was cleared to be so close to so many heads of state given his condition? Jantjie’s being cleared to interpret for such high level people at such a high value event highlights just how important thorough background reference checks can be when hiring interpreters. It didn’t take much to immediately see that something was wrong with Jantjie’s interpreting skills. For example, he had a very limited number of handshapes and movements that he repeated regardless of what was being said, he did not use facial expressions or have a structure to his signs. On the other hand, Claire Koch was a natural signer who not only followed the content of the performance, she used signs, expressions and body movements to match its spirit. When comparing Jantjie and Koch it was obvious that one was a fluent native signer and one was just lost. When hiring interpreters you want to be sure to use interpreters who have the right language skills. We recommend that you only work with native language interpreters who interpret primarily into their native language. If you cannot find native language experts, be sure to at minimum hire interpreters who are certified and have been tested on their language fluency skills. Beyond hiring native language experts, when possible you want to be sure that any interpreters you hire are also subject matter experts. Interpreting is more than swapping the words of one language for those of another, it is rendering concepts and ideas, feelings and values from one language and culture into another language and culture. At Language Scientific we like to say, “if you do not understand it, you cannot interpret (or translate it).” Interpreters must understand the concepts in the source language before then can render them into the target language. The most fluent native language interpreter will still be at a loss if they are asked to interpret technical, medical or scientific contentthat they do not understand. Hiring subject matter experts helps to ensure that your interpreter is familiar with the vocabulary and ideas that will be conveyed. As we saw with Thamsanqa Jantjie, hiring an interpreter that is unaware of or does not follow the Code of Ethics is incredibly risky. Professional interpreters must follow an interpreter’s Code of Ethics that covers many aspects of interpreting, including that interpreters will maintain confidentiality, interpret faithfully and exactly what was said, will remain neutral and not give advice, will accept jobs with discretion towards their own skill level, and maintain their professional skills and knowledge for interpreting. Had Jantjie been following the Deaf Federation of South Africa Interpreter Code of Ethics, he never would have accepted the job for interpreting the Mandela memorial, and even when on the stage, when he realized that he was unable to interpret, if following the code of ethics, he should have stepped down. There is no underestimating the power of the interpreter’s Code of Ethics to protect the speaker, the audience and the interpreter during any interpretation. Be sure to only hire interpreters who are familiar with and committed to upholding the Code of Ethics. While it is darling and amazing to watch little Claire Koch interpret, or rather sign sing, her holiday performance for her parents, it does beg the question, were there other interpreters there also interpreting the program for her parents? While Claire is indeed thoughtful when signing for her parents, let’s hope that she did not have to because no interpreters were on hand. Too often CODAs (Children of Deaf Adults) are forced into the interpreter role and studies show that this can do real harm. In my own interactions with the Deaf community, I have seen young children forced or expected to interpret for schools, churches, family members, legal situations, hospitals, pharmacies, doctors and even bill collectors. It is unethical to have children thrust into the role of interpreter. The amount of stress (and even resentment) this puts on both the children and the Deaf, the potential for error and the liability issues should all be sufficient reasons to hire real interpreters and let kids just be kids. Even if the children can interpret, it does not in any way mean that they should. Claire Koch was clearly thinking of her audience (her Deaf parents) when she chose to sign the holiday program at her school. Jantjie was not concerned with the feelings or respect of his Deaf audience when he chose to continue “signing” even when he knew that he was unable to perform the task. A good interpreter will always put audience considerations over personal pride, embarrassment or saving face. Had Jantjie deferred to the audience and simply sat down, it would have been a poor reflection on him and event organizers, but better overall. Not having an interpreter would have been better than having someone stand there seeming to make a mockery of South African Sign Language during a state memorial service. Hiring a poor quality interpreter without language skills shows not only ineptitude, but also great insensitivity towards your audience, their language and culture. Hiring no interpreter is better than hiring one that will offend your audience. Respecting your audience and their language should be top priority with any interpreting hire. It is rare and wonderful to see sign language dominating news cycles. For better or for worse, whether called hero or villain, both Claire Koch and Thamsanqa Jantjie put the spotlight on the Deaf community and their sign languages. Let’s hope that we can learn from these performances and improve interpreting services overall. What other lessons could we learn from last week’s sign language performances from Jantjie and Koch? What recommendations do you have for those hiring interpreters? Please share your thoughts and suggestions in our comments section below. Thank you for liking and sharing this blog socially!